Typically, this is the time where we review the year and reflect on the good (and not so good) events of our lives. When I was younger, I used to love to watch all the 'Year-In-Review' shows shown by various news outlets. Now, eh...not so much. A few years ago, my son had graduated from high school and as a stay-at-home-mom of only one child who was basically grown, I found myself with a bit more time on my hands. I had already found the OKCMGQ online, and had joined, but I hadn't attend any meetings. You know, it's sometimes awkward to go to a meeting by yourself when everyone online seems to know each other. The new year came and I told myself that I was going to get out more and expand my horizons. I finally went to a guild meeting (which was in the back room at Quiltworks) and no joke, there were like...six of us. A few other members trickled in and I soon made lifelong friends. If you haven't rejoined the guild yet, just click on the PayPal button on the sidebar. Honestly, the guild will not the same without you. We need everyone to make it the awesome group that it is! If you're lurking and wondering....join us Monday, January 12th (Click on Meetings/Area Events on the top menu for location details). Try us, you'll like us! We've had a GREAT year in the Guild. We've grown by leaps and bounds and have inspired each other and the world around us. 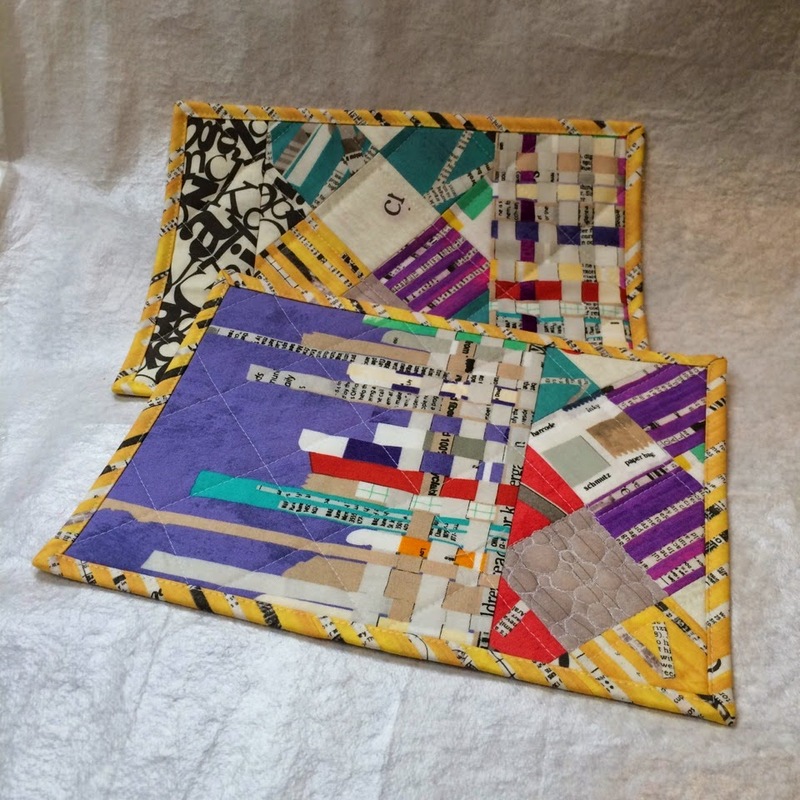 How awesome is it that there is now a modern quilt guild in Budapest?!! I'm not going lie, I got teary eyed when I read on Facebook that they'd started a guild. I can't wait to hear more from Agnes about her trip at our January meeting. How was YOUR year? Did you keep the resolutions or achieve the goals you set last year? Are you going to make new ones this year? What new project are you excited to take on? 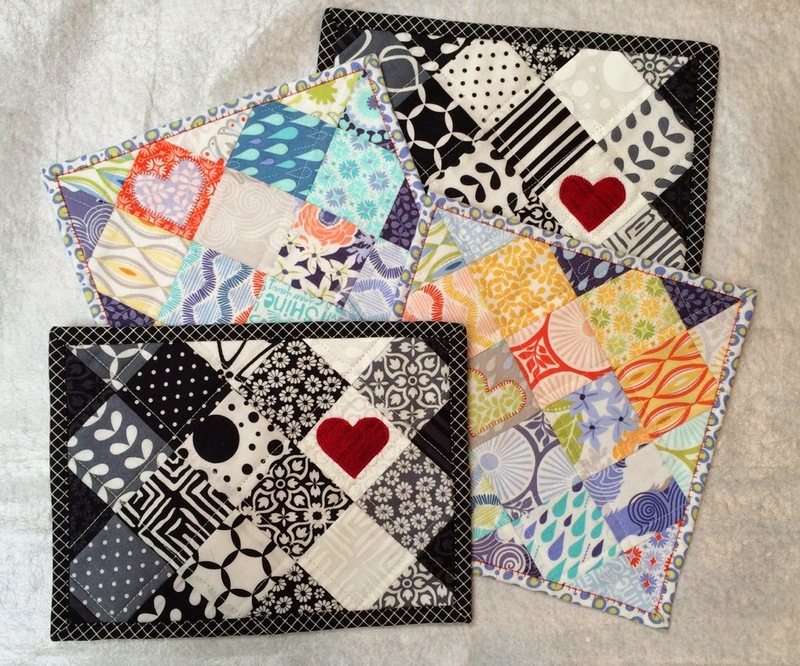 Here are a few finishes to wrap up an outstanding year of modern quilting! I have also learned never to ask my husband again whether he would like a cute small present for the office....turns out there are EIGHT people he needs to take mug rugs for! So I came up with the mug rug by-the-yard method, ha! 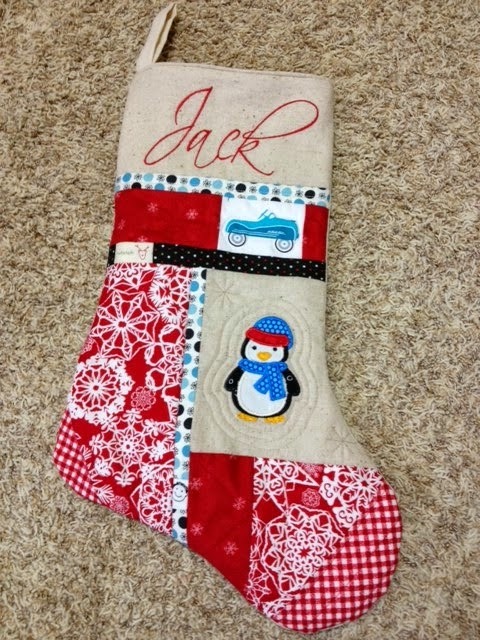 Debbie A. has this cute stocking to show that she made for her new grandson this year. Incidentally, she first made this pattern in a class a couple years ago taught by our own Emily Siemers. I'm told that Emily has agreed to teach the class again next season! Bri W. finished this sweet quilt. 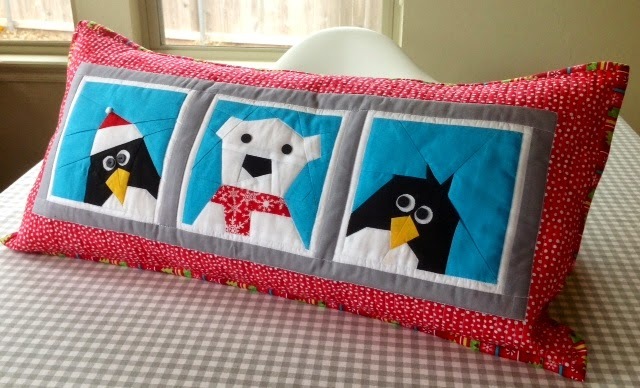 It is the Shortcake Quilt, pattern by Allison Harris of Cluck Cluck Sew. 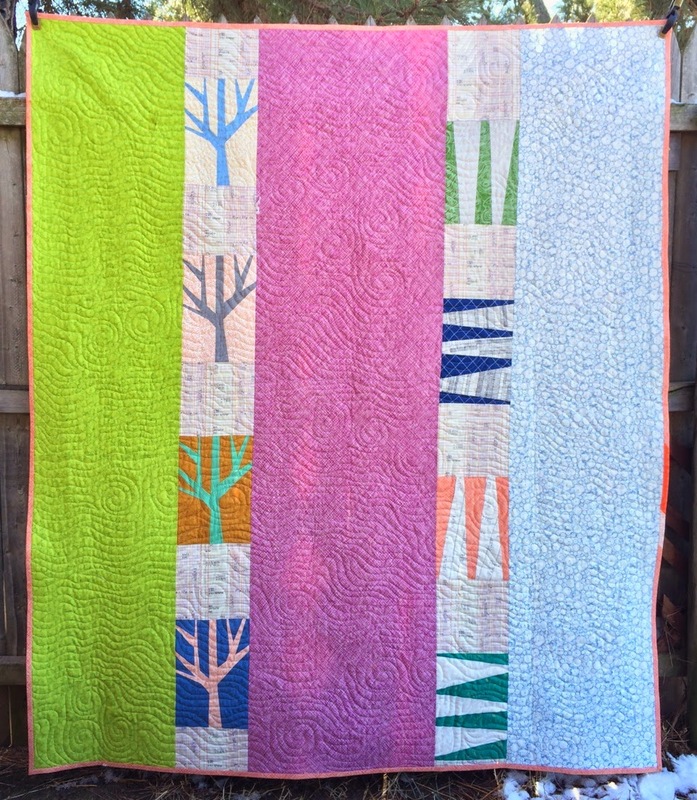 Bri used a Notting Hill jelly roll and plans to put it in the OKCMQG display at the OKC Winter Quilt Show. Ann S. has been a busy woman. First up, her 2013 BOM from Quiltworks is finally done! Ann started it just a while after first learning of Carolyn Friedlander. She fell in love with the 'Architextures' fabric line from the first time she saw it, so committing to the BOM was easy. Ann substituted two of the blocks with her own paper pieced rendition of her house. By taking so long to get it done, Ann was able to add in Carolyn Friedlander's following lines, 'Botanics' and 'Doe.' 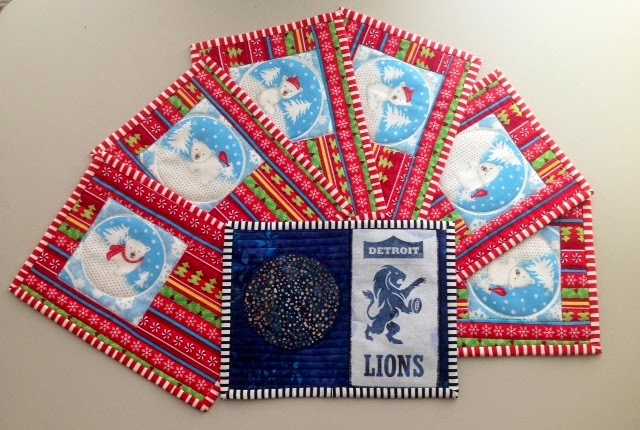 Beautiful job, Ann! Ann can't seem to stop piecing her backings. Last July, I had the chance to take the Olive workshop with Carolyn herself. (Thrills and shivers!) In addition to having her autograph one of my house blocks (lower left), I wound up with a stack of paper pieced trees. I wasn't planning to finish them according to her pattern, so including them here was just right. The remaining blocks are Totem-esque. 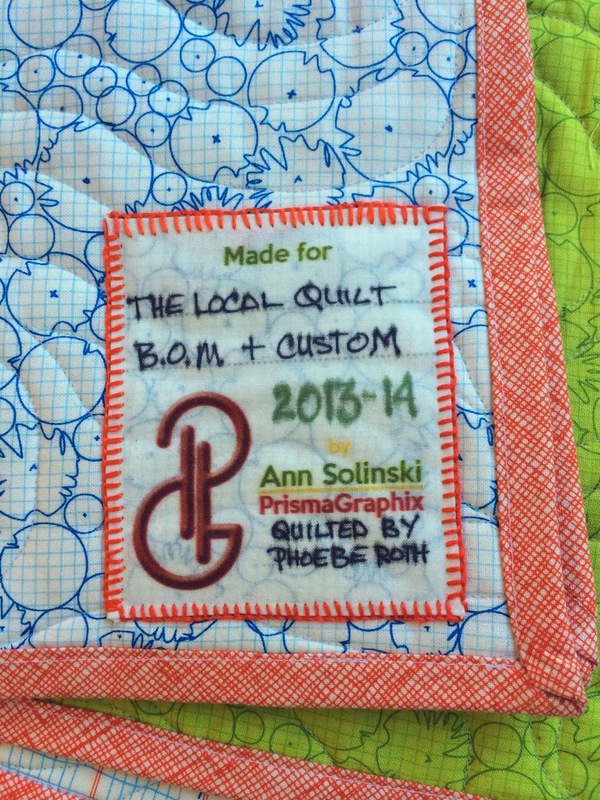 I recently ordered yardage from Spoonflower and some of it was personalized quilt labels. This is the first one I've used. Hand stitched, to boot! May rethink some of my labeling options, but this works for now. Done IS better than perfect. Speaking of such, there's a doozy of a humility block in this one. It went completely undetected until I was delivering front and back to the quilter. She saw it. Too late to replace it and I didn't want to delay the process. So, there it stares back at me with impish glee. Ann says it takes her a while to get geared up for the holidays. She finally got around to gift sewing just a few days before Christmas. Of course, there was our Guild gift exchange earlier in the month. 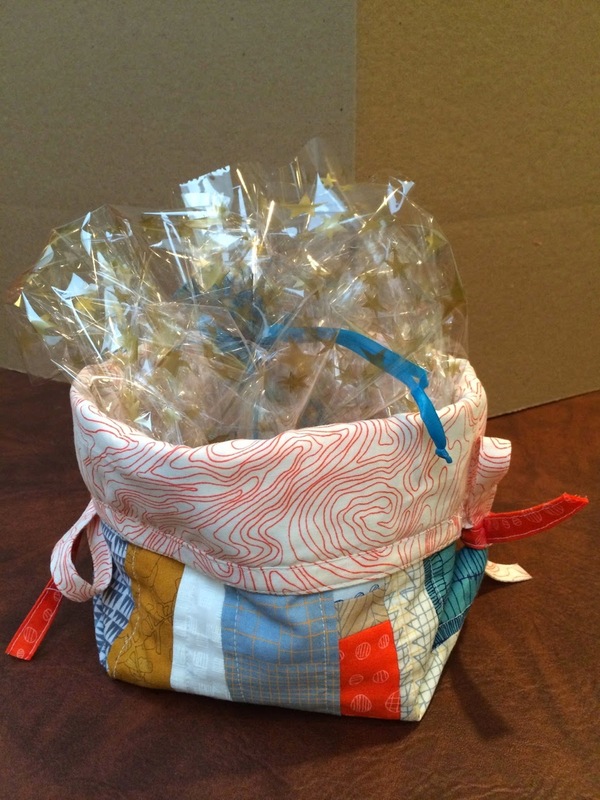 She pieced a sampler of Carolyn Friedlander fabrics together to make the exterior of a Task-It Basket. Ann loves that Angie Bullard received it. It's very different from her usual fabric choices. The second was for a friend who loves Felix the Cat, and his bag of tricks. Ann ordered fabric and it wasn't what she envisioned. 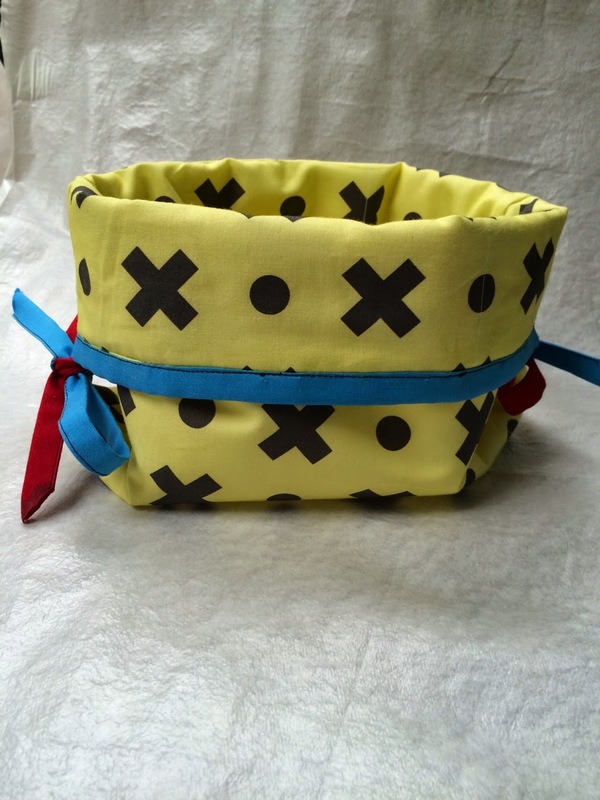 She wanted to make a big satchel frame type bag but since she wasn't happy with the fabric, and in order to have something to give her friend, Ann opted for another Task-it Basket. But wait...there's more! There were also mug rugs. 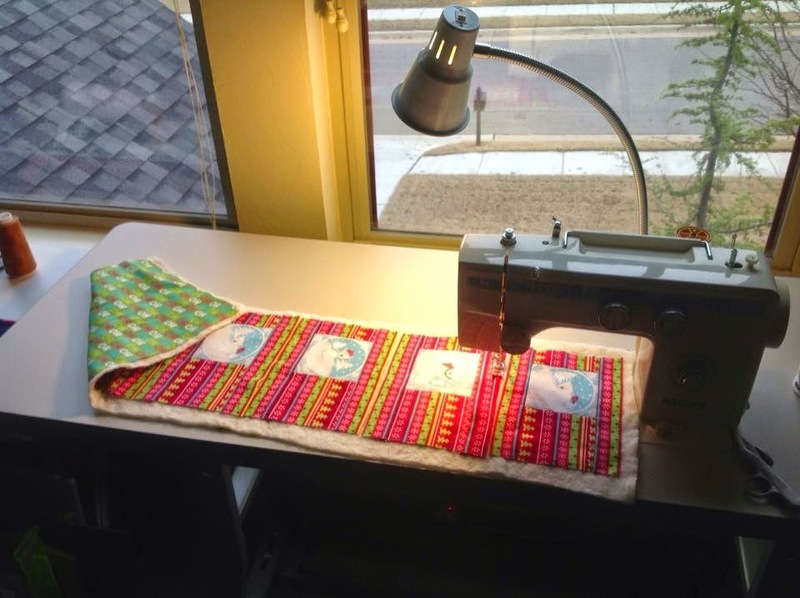 All tolled, Ann was quite surprised how much time went into what she imagined would be quick projects. (Yep, I'm still working on 12 mug rugs myself!) Many thanks to Queen Elizabeth for on-point mini-charm technique and Leslie for the fabulous binding short-cut! 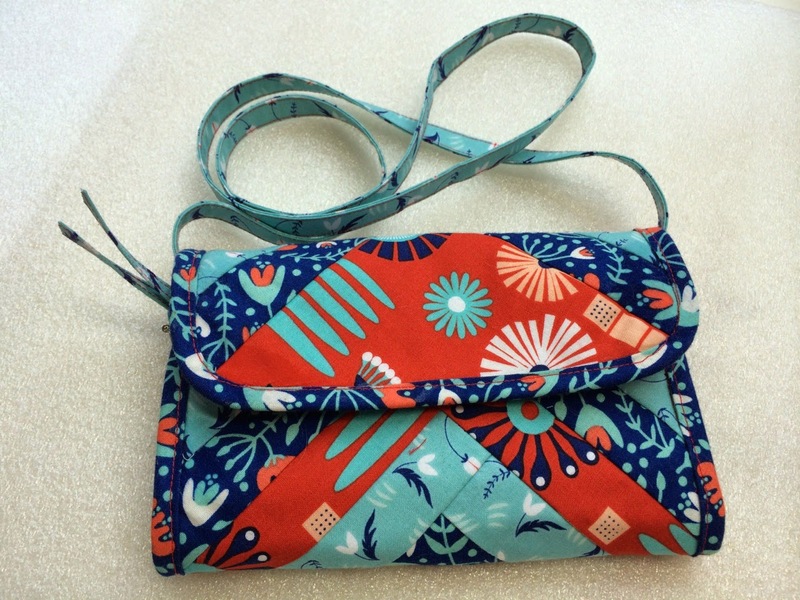 And...Ann finished up the fun with another Quilter's Wallet. 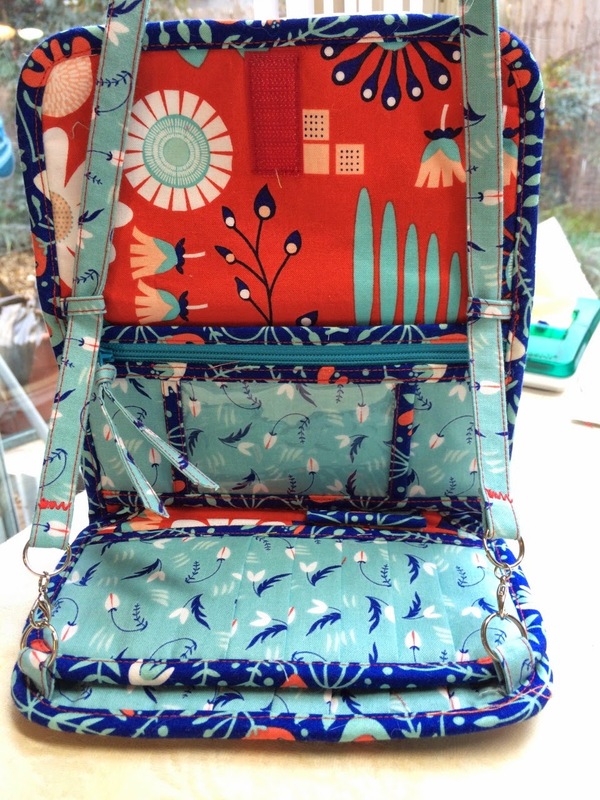 She added the loops, shoulder strap, and hardware on this one. Love this fabric!!! 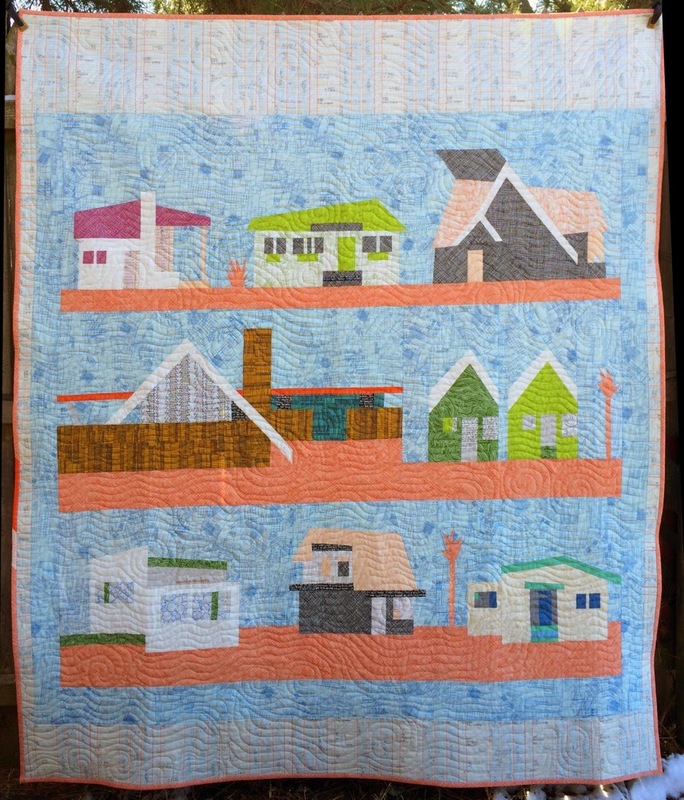 And finally, we have this lovely quilt from Robin O. How's this for a last-minute gift? I took Stitched In Color's Angled class in the fall, and then when a family member fell on tough times, I decided I just *had* to give her a Christmas quilt to cuddle. 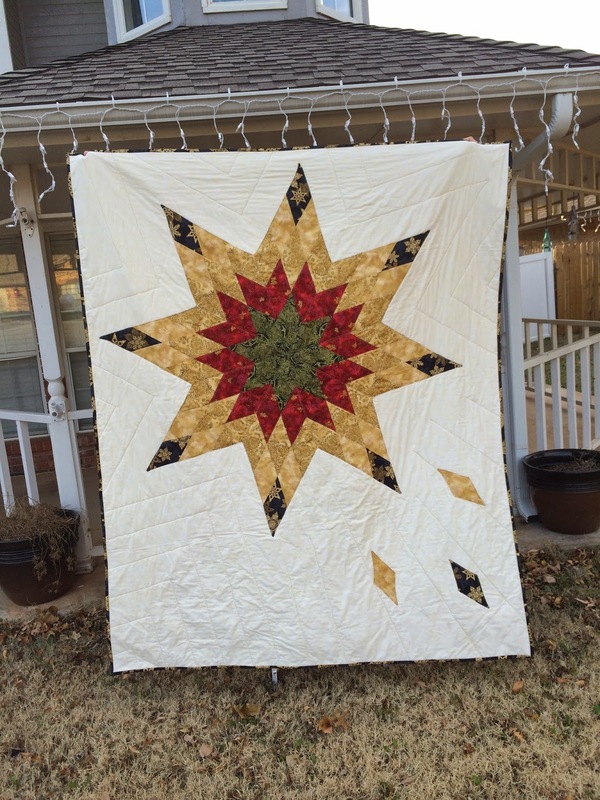 The pattern is based on Rachel Hauser's Emerge quilt, the feature fabric is from Robert Kaufman's Holiday Flourish line, and the whole thing went from "prewashed fabric" to "completed quilt" in just over 30 days. Needless to say, after I finished this, my major Christmas gift to myself was no more projects with deadlines! I need to give myself that same gift Robin! Wonderful quilt and we know it'll be so appreciated! Okay, I'm exhausted after this post. Thanks to everyone, not just this month, but all through the year for sharing all your wonderful projects with us. May the new year bring you joy, happiness and beautiful fabric! Link up your December finishes below! See you next year!